Senate Minority Leader Chuck Schumer, D-N.Y., joined at right by Sen. Amy Klobuchar, D-Minn., speaks to reporters at the Capitol in Washington, April 9, 2019. The top Senate Democrat says President Donald Trump's picks to fill two vacant seats on the Federal Reserve Board are unqualified for the job. 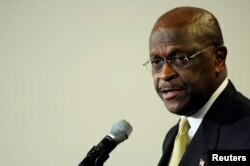 FILE - Former Republican presidential hopeful Herman Cain speaks at the National Press Club in Washington, Jan. 24, 2012. "I don't see the qualifications of Cain or Moore fitting in with the mission of the Fed, which is to conduct monetary policy and not be political," Sen. Chuck Schumer said Tuesday. Cain is best known as the former CEO of the Godfather's Pizza chain and a failed 2012 Republican presidential candidate. Opponents to their nominations say they could compromise the Fed's credibility as an independent policymaking body that responds only to economic trends, not politics. Chief White House economic adviser Larry Kudlow told CNN television that Cain and Moore are both "very smart people" and said Trump has "every right to put people on the Federal Reserve board ... who share his philosophy." Senate Republican Leader Mitch McConnell has not commented on the qualifications of either man, only saying "We're going to look at whoever the president sends up."